In 2004 four people came together in a small town in the foothills of Northern California to establish Integrated Fire Systems, Inc.; a fire and life safety company that does it all. Their vision for this family based company to inspect, install, service, and monitor fire sprinkler and fire alarm systems was to not only provide top of the line service, but to make sure that their customers’ needs were always in the forefront of the company’s mind. Over 10 years later IFS now based in Rocklin, CA works all over Northern California. As IFS continues to grow, their mindset of small business charm and keeping the customer first priority has never diminished. 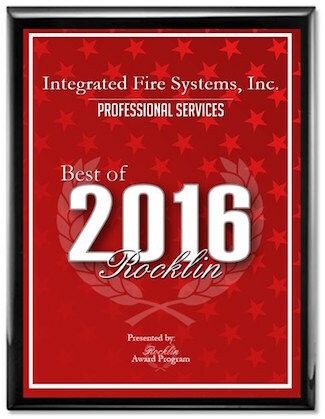 Integrated Fire Systems, Inc. succeeds by delivering outstanding performance. We believe in service beyond expectation achieved through a constant desire to anticipate and fulfill evolving customer needs. The honesty, intelligence and commitment of our people are vital to Integrated Fire Systems, Inc.’s mission. We share pride in the company and respect each individual’s contribution at every level. Exemplary customer relationships drive Integrated Fire Systems, Inc.’s growth and prosperity. The team at IFS is a cut above our competition! Each field technician is highly trained in their field; our fire alarm technicians all hold their fire and life safety certifications, and our fire sprinkler technicians are exceedingly trained in NFPA 25 codes and standards. The office staff is well in tune with our field staff, and holds our customers’ needs to the highest regard. Our goal at IFS is to make our customer’s involvement in their fire and life safety needs as effortless as possible.